“Not watching a performance of water puppetry means not visiting Vietnam yet.”. This is the practical advice appearing in many guidebooks in Vietnam. 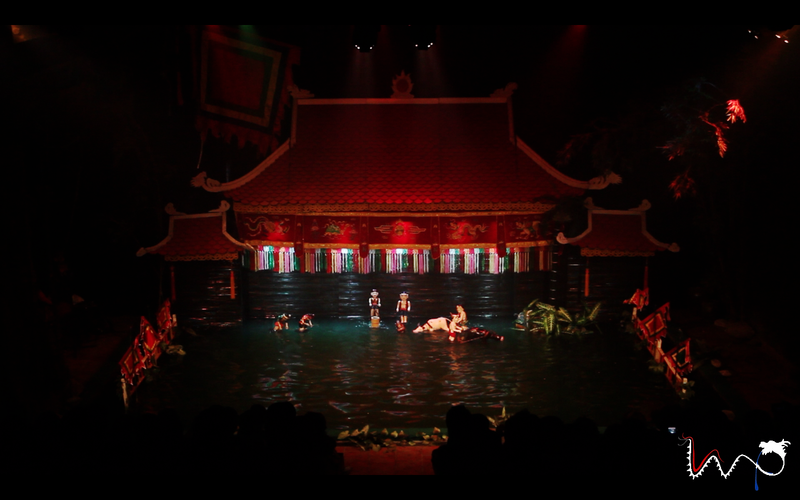 And it is so true that most visitors to Vietnam try to watch a performance of water puppetry at least once. And after the performance, most of them are excited and always repeat this advice to their relatives who are going to take a tour to the beautiful country named Vietnam. Water Puppetry is full of joys, lighting and colors, myriad charms and shocking surprises. This is the feeling of those who are watching a performance of water puppetry. At the village pond, a swimming pool or the water stage in the puppetry theatre, colorful puppets dance and perform numerous interesting items accompanied by animated music and singing. They can even perform acrobatic or spectacular acts which cannot be done by modern robots. You will see no puppeters, no machines or instruments, and even no controlling string and poles. You only watch the puppets on a shimmering water surface.